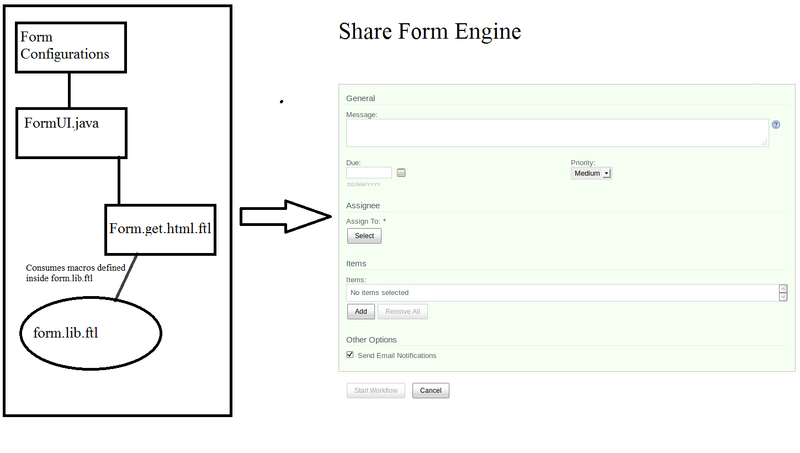 It was always interesting for me, to know that how the form is getting rendered in alfresco share.As a beginner, developer start with customizing share-config-custom.xml where we are defining the forms for workflows, document types, aspects.Configurations for content type,folder type and workflow forms are the major things which is handled by share form engine.But there are other interesting things as well like validation handler,configurations of set(grouping fields) etc..It will be interesting to know, that when we are defining this in share configuration , how alfresco is using it internally.So let's begin. There are multiple places from where. form is getting rendered.Few examples will be , Edit properties dialog,Edit Properties Page,Create Document etc..Apart from this, form can be opened by some custom actions as well(by specifying itemid ,itemkind and form id in argument). This all things will call only one webscript which is responsible for rendering form, that is the webscript Form Component.Let's take a look on each file of this webscript. As the name says its the webscript descriptor file.Nothing major to describe. This file is defined under ,common-webframework project,It contains the java bean for injecting webscript.Below is code of it. Its a normal thing that we get confused between looping when we are using list, hashmap or array in freemarker .As the syntax differ for each things in freemarker. It also happens that when we want to generate JSON from java collection, we need to append comma on each iteration except the last one.Identifying an last iteration is also an issue when we use freemarker. Its not much difficult, its just we are not concentrating on syntax. So lets look on the syntax of each one. There are many cases where we need to append comma after each iteration and on the last iteration we need to ignore it.This is kind of bit tricky in freemarker if we create one local variable as counter and manage it for last iteration.Luckily we have flag available in freemarker for checking the last iteration.So let's take look on that. item_index (deprecated by item?index): Index of current item in the loop. item_has_next (deprecated by item?has_next): Boolean value that tells if the current item is the last in the sequence or not. There has been always requirement in one or another way to export data in excel or CSV. There are many developers who are find difficulties in developing a feature like this.Gagravarr has given a very good example on exporting datalist in to an excel file.Main files which are responsible for downloading excel file and generating data are on git. One problem in this code is that parent webscript class is DeclarativeWebscript. This shouldn't have been used as in this kind of webscript controlling the response becomes more complicated. In the code written by Gagravarr , controlling the response type is implemented by overriding methods named as createTemplateParameters and creating a new subclass named as WriteExcel and putting object of a WriteExcel class in model variable and finally it calls the write method of WriteExcel class from the response templete(freemarker). We can definitely customize this for any kind of data which we want to export in excel file.The main issue with this code is , its too complicated to understand,So i finally decided to create a simpler version of it for those who are starting up with alfresco.In real time scenario I have taken a reference from code written by Gagravarr , as I am able to fully understood it. So let us begin on how we can export any alfresco data in a excel spreadsheet. For exporting data in excel there no special case.The only artifact which we need to consider is java backed webscript. So let's begin with same. As usual we will be needing one descriptor file. Now we need to create one spring bean for java baked webscript. // Set Header for downloading file. * methods as well which will help to generate data. * Used for generating header in excel. Now let's understand few of the things from above code and how to customize it.I have added comments on method, they are well explanatory.There are few things which I would like to explain further more on this.So let's begin on that. You can update header values from generateHeaderInExcel function. Use spring injection to use alfresco services. We have seen generic example on how we can export data in excel from alfresco using webscript. Now let's add some real time example in it. We will add one custom action in alfresco share on folder named as Export Data. What this action will do is that it will export all the data of its children in excel file.Exported excel file will have only few common properties in it like Name, Title , Created Date etc..
For adding action on share side you can refer Share DocumentLibrary Action blog for more details.For adding custom action you need to follow below steps. There are multiple ways of adding custom action in share, you can add it in share-config-custom.xml or as a new approach you can add xml file inside site-data/extension. We will go by second approach. Now let's make required changes in webscript.As we need to fetch properties from node we need to inject nodeService in webscript.For that we need to update bean definition as below. Apart from this there are few function which we need to update.The first one is execute(WebScriptRequest req, WebScriptResponse res),In this function we need to fetch the nodeRef which is passed from client side and send it to another function , for using it for future purpose. Second function which we need to update is getHeaderList This function includes the details of header.We need to add list of column name which we need to populate. Third function which we need to update is generateDataInExcel,In this we need to include an argument folder node and pass it in to getData function.One more change in this function which we need to do it handling the Date object, there things which we need to export are of string type those are already handled in this function.We need to handle an date object here.Function will be updated like below for that. Now in getData function, we need to get actual data from children and return an list of it.Code should be updated for that function like below. Once all above things are done , you will find an action on foldernamed as Export Data, on click of it , it will export data of its children in excel. Github link for above example is here.